An S-Corp can save a small business quite a bit in self employment taxes, but there’s definitely some drawbacks and things to watch out for. 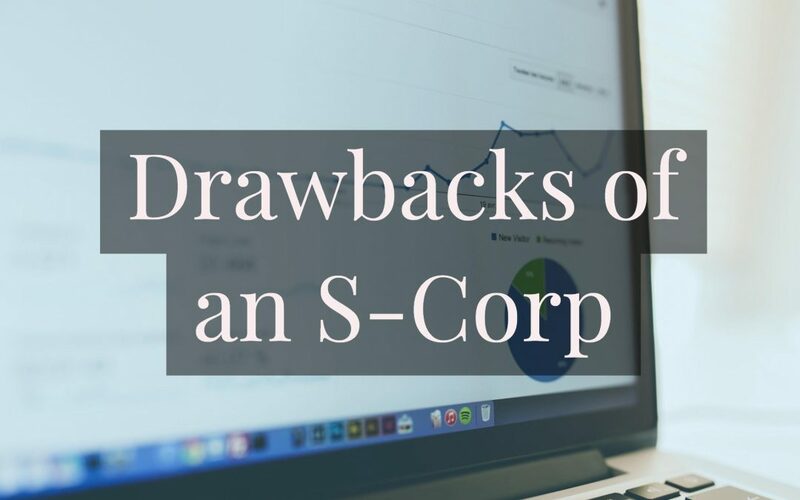 I’m going to share three of the biggest drawbacks involved in converting to an S-Corp, or becoming an S-Corp, because I hate it when I find out drawbacks or problems, after it’s too late. So I’m going to share the drawbacks, that you should know about, before becoming an S-Corp. So I’m Rob Satrom and we have two companies – Nuance Financial Tax and accounting and FeedbackWrench Web Design, SEO and marketing. For Nuance Financial, we help business owners focus on what they do best, by being their outsourced accountants – we just handle all the formalities and complexities for small business to run an S-Corp.
And then with FeedbackWRENCH, we help small businesses go from good to great, by helping them make the web their best employee. We specialize helping small businesses – particularly CPA’s and accountants become profitable and then their local markets with SEO, web design, and online reputation. I help accountants make lots of money – with very few clients – so go to FeedbackWRENCH.com if you’d like a phone conversation. Let me share a quick real world story of the importance of measuring twice and getting this information ahead of time…. a personal story of the importance of knowing ahead of time…. It’s really easy for me to be naturally cynical, especially when somebody’s giving me advice and they’re not telling me what to watch out for in the future. About 10 years ago a good friend of mine invited my fiancé and myself to go out to his cabin. This cabin is was up in Ely Minnesota, which is covered in beautiful kettle lakes, stock full of walleyes, covered in forest, and his parent’s had purchased a very large cabin that was on the border of a state park – we were pumped. He didn’t want everybody to drive up there, because there wasn’t room for all the cars, so he told us we could carpool with his sisters boyfriend if we want. I never really knew him, and hardly knew his sisters…. I just assumed everything would be alright… and that my friend would OBVIOUSLY tell me if there was something I should know about before deciding to carpool with these guys. All was fine – my wife and i were getting to know these two… but then about 1 minute into this car ride, this guy pulls right up behind the car in the passing lane going about 85 miles an hour…. in a 70. The guy ended up pulling over out of the passing lane, and our driver pushed the gas down to accelerate – up to about 90. When he reached the next car, we hadn’t been on the freeway for 4 minutes before I felt so unsafe and uncomfortable that I had to ask…. That was the longest 5.5 hours I’d ever had in a car. This guy ended up having to drive us down two lane roads in the Minnesota woods that had deer carcasses left and right – and we was going 20 over the speed limit the whole time. I was so mad at my buddy for not telling me about the drawbacks of riding with this guy – I was just ticked. An S-COrp has three things that could be the same if you’re not careful. Here are the three major drawbacks of an S-Corp. If you’re going to convert to an S-corp, that means that in order to partake in the tax savings, you’ll have tax and legal formalities that you’ll have to abide by. a. Accounting and Bookkeeping to determine the reasonable salary. The first formality that you’ll have to manage is this tension between a reasonable salary and the owners distribution. If you’re not familiar with what I’m talking about, then please check out our other YouTube videos. The bottom line is that you need to take a salary which is reasonable according to your net profit and a number of other factors. This means that you’ll want to be on top of your bookkeeping and accounting throughout the year so that you know exactly how much should be taken as a salary, and how much should be taken as a distribution. So the first formality is a bookkeeping and accounting system so you can determine and substantiate decisions made to manage the tension between the salary and dividend or distribution. At Nuance Financial, we hand all this and we hook all our clients up to QuickBooks online and keep it up-to-date every week. If you didn’t know this, the government has spent its Social Security money, which means that anyone partaking in the tax benefits of an S-Corp, will be held to a strict compliance for remitting the social security and Medicare taxes. Because of this strict compliance, it’s a very good idea to use a payroll system. Here at Nuance Financial, we tend to use ADP or intuit’s products, because we get a wholesale price on them. When you add up all the fees associated with using another solution, we usually end up being a much better solution for small business owners than hodge-podgeing a separate bookkeeper, CPA tax planner, tax return, payroll solution, and the rest. We’re a one stop shot. You’ll want to use your payroll system to remit your taxes in order to keep you compliant. So the formalities so far, are that you’ll want good bookkeeping so that you can manage the tension between the reasonable salary and distribution, you’ll want to remit through a payroll system, and then you’ll also have a more complex tax return. c. An S Corp. will have what’s called an 1120S tax return. The S Corp. tax return is a bigger return and you should expect to pay anywhere between $200 in $1500 depending on how proud, the preparer is, of his work. What we do at nuance financial is include all of this bureaucracy, for a flat monthly fee, with no annual contract. For really basic cases for people such as real estate agents or 1099 income earners and single owner S-Corps owners, we charge between $300 and $600 a month, to include absolutely everything. The reason we’re able to do this, is because we’ve decided that this is the only kind of work we do. We’re outsourced accountants for small businesses – that’s it. So far I’ve been talking about all of the accounting requirements and formalities, but there are a set of legal formalities you must abide by as well. Converting to an S-Corp means you’ll need to have a Board of Directors, shares of stock, operating agreements, share holder meetings, and some other documentation. Since we are not attorneys, we’ll just let you know that there are some simple solutions out there at legal zoom or your local attorney. All that is under the first major drawback – the tax and legal formalities required.. but the second and third are more subtle and something you usually don’t find out until it’s too late in life. In order to be eligible for social security benefits – specifically the retirement benefits – you need to be eligible with enough “work credits”. Work credits are points that you earn for being employed at a minimum level throughout your life. You can only receive four work credits per year, no matter how much you earn. But after 1978, the rules were changed to make earning credits much easier. Now, you’ll receive all four credits, so long as you earn a minimum amount in the entire year. In 1978, you’d get all four work credits if you earned at least $250, but in the year of 2016, that amount was up to $1,260. So to be eligible for Social Security retirement, you need to have at least 40 work credits, essentially 10 years of work. But then, to determine the amount of your benefit, there’s a convoluted system that determines what percentage of your earnings you’d receive – the average of your highest 35 years of employment. Why does this matter? Well, for S-COrp owners, that social security benefit is calculated on the salary portion – which is why you save on the self employment taxes. You’ll have to take what’s called a “reasonable salary”, which varies quite a bit. The social security limits – the amount that social security benefits would be calculated on, stops at $118,500 in 2016, and goes up slightly every year. Therefore, you need to be careful that you understand that your social security benefits will be determined by your salary – not your schedule K or owners dividend or distribution. You’ll pay much less in social security taxes – but then your benefits will be adjusted downward as well. The solution is to make sure you’re investing for retirement, being financially wise, and taking some of your tax savings and to prepare for the future. This is kind of a big deal – but there are many arguments that would say social security provides a meager payout in comparison to the opportunity cost of market investments. IN other words, maybe you’re better off investing into a vanguard individual 401k, or just low cost S&P 500 index funds at Schwab, fidelity, or vanguard. We tend to teach people that the markets perform MUCH better than the social security tax benefits. If you don’t like the markets, maybe you’ll take the saved self employment taxes and invest it into rental real estate or something. So the first drawback is are the formalities you’ll go through, the second is that your social security benefits will be lowered, and the third is ……….. that you’ll lose a little bit of opportunity to invest massive amounts into retirement plans or to get higher mortgage approvals. If you’re going to do a SEP IRA, a 401k profit share, or a defined benefit plan, you’re maximum contribution is primarily tied to the salary portion of the S-Corp. I won’t dive into all the different rules and examples, because they change a little bit every year, but all I’ll say is that 401k employer contributions and the employee contributions are tied to this S-Corp salary, and not to the schedule K dividend. The employer side contribution is often called a “match” or a “profit share” side. Most plans allow you to pick a percentage of schedule C business income, or the salary of an S-Corp, up to 20 or 25%, to make not to exceed about $53,000. I’m trying to simplify it – but the bottom line is that you’re contributions are tied to the salary alone. Profit share, or employer contributions to plans, are extremely tax efficient; but an S-Corp trades the benefits of reduced social security taxes, for some limitations on the amount your could place in tax deferred retirement plans. If you’re applying for a conventional or FHA loan, you’ll quickly realize that business income needs to be locked down for a period of two years before it’s even taken seriously, and then you’ll notice that it’s the S-Corp salary, not the contribution, that’s considered for a regular old mortgage. Therefore, if you’ve got homebuyer’s fever, you’ll need to take a cold shower and realize that in exchange for saving thousands in taxes each year, you’ll be approved for a traditional type mortgage at a lower rate because only your salary is considered in the equation USUALLY. If you’d like to lend at the higher levels, and have your business income considered, it’s usually a good idea to work with a smaller bank, and you would then expect not to have the lowest interest rate. Banks will give loans with more risk in exchange for higher interest…. that’s how lending works if you didn’t know that. So I recommend that you just save up more cash and have a bigger down payment, and take a cold shower, rather than leverage way up with a private lender because you are lusting after a house that’s just outside of your reach because of the S-Corp strategy. To conclude, lower mortgage approvals, lower retirement contribution limits, formalities, and lowered social security benefits are all drawbacks of an S-Corp – I hope this is helpful and we’d love to help you’re small business as your outsourced accountant – no matter where in the united states you are. For a flat monthly fee, we’ll handle all the bookkeeping, payroll, accounting, tax planning, S-Corp salary decisions, paying in your taxes throughout the year, coaching and training to mitigate the taxes, and then finally do your S-Corp and personal taxes. For small businesses, these services range between $300 and $2500 a month – which is really low when you consider that the alternative is to hire an in-house accountant. Which even at $20 an hour working about 5 hours a week, would end up being $5,200 in pay for just a little bit of mediocre help. At Nuance Financial, we’ll be using a team of CPA’s master accountants, and experienced people to do this all over the cloud OR in person. Please reach out if you’d like help – but only if you’re serious about letting someone handle this stuff for you, so you can focus on your business. Again – I’m Rob Satrom from NuanceFinancial.com and Feedbackwrench.com and we’d love to connect with you.